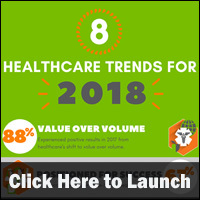 A new infographic by the Healthcare Intelligence Network examines eight key healthcare industry trends for 2018. 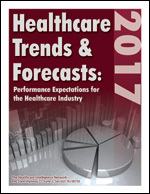 Value-based healthcare, the drive for quality and the uncertainty regarding the Affordable Care Act under the President Donald Trump administration are just some of the factors impacting the healthcare industry this year, according to HIN’s Healthcare Trends & Forecasts in 2017: Performance Expectations for the Healthcare Industry. 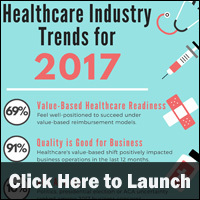 A new infographic by HIN examines the key trends that will impact the healthcare industry this year. Cost, quality and access challenges will continue to spur healthcare reform initiatives, according to a new infographic by EY. The infographic examines how the growth of patients with chronic disease is impacting the system, how connected healthcare is transforming healthcare and what’s driving developments in personalized medicine. 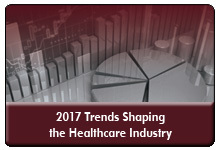 The potential for changes to the healthcare regulatory environment and market structure based on the outcome of this year’s Presidential and congressional elections, the continued drive toward value-based models and the upcoming changes in physician reimbursement are just some of the trends that will continue to impact the healthcare industry in 2017. Combined with the consolidation in the industry and flux in the health insurance exchange market, there’s no shortage of challenges and opportunities for healthcare organizations in the year ahead. 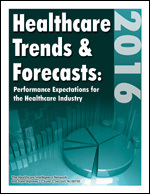 Trends Shaping the Healthcare Industry in 2017: A Strategic Planning Session, a 45-minute webinar on November 17, 2016, at 1:30 p.m. Eastern, Steven Valentine, vice president, Advisory Consulting Services, Premier Inc., will provide a roadmap to the key issues, challenges and opportunities for healthcare organizations in 2017. 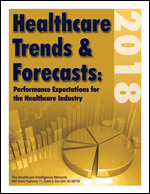 Of all the currents disrupting healthcare, from consolidation to the swing toward value-based care delivery and reimbursement, population health management topped the list of transformative industry trends for the second consecutive year, according to the 2016 Healthcare Trends & Forecasts survey by the Healthcare Intelligence Network. 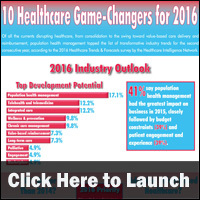 A new infographic by HIN examines the top areas for development in the healthcare industry in 2016, areas with the greatest budget impact in 2015 and the trend toward value-based reimbursement. 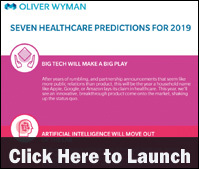 From the embrace of omni-channel experiences to the revision of physician alignment strategies, Oliver Wyman outlines 10 predictions for the healthcare industry in 2016 in a new infographic. While healthcare, as a whole, continues to evolve, so do the opportunities for accessibility, efficient delivery, provider alignment, and ultimately, a value-based healthcare system, according to a new infographic by Legacy DNA Marketing Group. 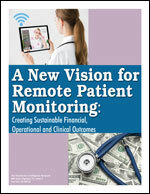 The infographic examines the 17 drivers and shapers of change in the healthcare industry. 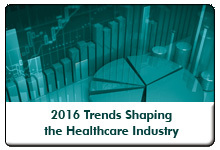 The continued consolidation of the healthcare industry, the drive toward a value-based payment system and the shifting of risk and costs to healthcare consumers are just some of the trends that will continue to impact the healthcare industry in 2016. Combined with an election year that’s expected to generate a lot of noise about the industry, there’s no shortage of challenges and opportunities for healthcare organizations in the year ahead. During Trends Shaping the Healthcare Industry in 2016: A Strategic Planning Session, a 60-minute webinar on November 12, 2015, at 1:30 p.m. Eastern, Steven Valentine, president, The Camden Group, and Paul Keckley, Ph.D., Managing Director, Navigant, will provide a roadmap to the key issues, challenges and opportunities for healthcare providers and payors in 2016. As the global market for prescription drugs surpasses $1 trillion this year, the push for value-based healthcare delivery and reimbursement is just one of the factors that will drive disruptive change in the healthcare industry in the coming years, according to a new report by the IMS Institute for Healthcare Informatics. The study, Harbingers of Change in Healthcare, identifies 10 recent events that represent turning points in the role of medicines in advancing healthcare. The 10 events are highlighted in a new infographic by the IMS Institute. Forty-four million people live with dementia worldwide, but that figure will increase to 135 million by 2050, according to Alzheimer’s Disease International. The total estimated worldwide cost of dementia was $604 billion in 2010, with about 70 percent of the costs occurring in Western Europe and North America, according to a new infographic from Bluebird Care. This infographic also includes global dementia statistics, main types of dementia, projections of future cases and its economic impacts. You may also be interested in this related resource: The Encyclopedia of Elder Care, Third Edition.